I always thought the trotro transportation industry (if I can call it that) was mainly made up of the car-owners, drivers, drivers-mates and passengers. But now that I think about it, I think the trotro transportation industry [to an extent] created the ‘kayayei’ and ‘kayahee’ – female and male porters [sub-industry]. It might be only me but I have observed that there is a need breed of male porters in town. They are more aggressive and carry good without using any wheeled contraption or aluminum container; the local porter’s tools of trade. These porters risk limb and life to get business and they do beat competition to business always. Their competitive advantage in this trade is their ability and willingness to jump on the fender of buses and peek in the back of the bus where load is stowed; literally looking for business. This blog post is in response to a comment posted by a reader who wants to know how the private transportation business is run in Ghana. I hope my research was exhaustive enough and satisfies other readers who might be interested in running their own trotro businesses as car-owners. The trotro business is a tough game; it tries the owner’s patience, negotiation skills and street-smartness as he tries to get the best financial benefit and road-life out of the bus. The search for a trustworthy and experienced driver is one huge hurdle one has to surmount in this business. Identifying which route to ply one’s trade often lies in the hands of the owner but can also directly impacts the search for a driver, where the bus will ‘sleep’ after a day on the road among other things. During a good stretch of time, daily sales (the money the trotro driver brings back after every day of work) comes in with no excuses of vehicular breakdowns. Sometimes the driver makes close to half of what they have to pay to their car-owners and is responsible for paying his mate and providing for his lunch. Typically, when a car-owner is giving a ‘new’ car to a trotro driver, he fills the tank of the bus in order to give the driver a head start. It is normal that the trotro driver fills up the tank when quitting. But to avoid any disputes over how much fuel cost at the time the driver started working with the bus and when he finally quit, some car-owners expect that the trotro driver brings the bus back to their premises with fuel tank filled every evening. A car-owner can and should institute a time for the bus to be brought back home for parking; 8pm is the usual set time. However, one should be highly tolerant of early morning calls, usually between 5am and 6am to hand over the car keys to the trotro driver to start the day. The early morning trips are good [money making hours] for the trotro drivers because the roads are much freer; please don’t mess with your trotro driver when it comes to releasing the keys. For trotros in all cases but only in few cases for taxis, they are registered at a bus-station where the bus will be stationed, plying a specific route. It is often at the station that the owner is informed of the fixed market sales that that type of bus makes a day. The factors range from number of seats, whether the bus has air-conditioning, the [distance of the] route it plies and other on-board services like on-bus entertainment. The station is run by a union (under the umbrella of Ghana Private Road Transport Union GPRTU) and as such car-owners meet periodically. Sundays are often the only days that most trotro drivers take some rest, other than those expect them to work on holidays (except Christmas) and weekends. At the end of the month, the car-owner pays the trotro driver a salary equivalent to 2 days sales and the cycle goes on. But no, something’s got to give whenever things are going smoothly and that is often the genesis and root of most of the problems that car-owners have with trotro drivers and vice versa. Out of the blue, the car-owner gets a call that the car is broken down at Kaneshie. Same call could have come from your driver at an accident scene; one he might be responsible for causing or not. And definitely it is normal in this line of business to have to go see one’s driver behind police cells/ counter-back or stand by him in a law court for some violation of traffic rules. It is all in the day of a trotro driver and the car-owner. For relatively new buses, car-owner hardly anticipate a break in the sales until they get a call one day that the bus is broken down. But for old buses, a typical car-owner prays that whatever breaks down on the bus is nothing [major] that cannot be fixed in a day. Usually after a rapid succession of break downs followed by massive spending eating into the trotro’s savings accounts, trotros begin to break down often. It is at this point that trotro drivers get the room to swindle their car-owners. One trick is that the trotro driver works to about noon and then calls the car-owner that the bus is broken down or that since morning the car has been over-floating (an old excuse from back in the carburetor days) or overheating, torn exhaust pipe or some other mechanical fault as such business hasn’t been good so the trotro is undergoing repairs at the shop. What this implies is that the little money the trotro driver made till then will be used to pay for repairs and therefore there will be no sales for the day. Some car-owners have been known to ask their drivers to repair buses with their own money and often do not pay the money back. Others have been accused of bullying the drivers by accusing them of being the cause of a mechanical problem or used the fact that the trotro driver would soon be poor if the bus is not on the road to coerce them to repair any faults. What is hard for most car-owners is when they get calls of arrest of their trotro drivers after they are caught overloaded, jumping the red light or not observing some other road/ traffic rule in a zone where they don’t ply and not expected to be. The trotro driver doesn’t mind overloading the bus to the point where the exhaust pipe scrapes the road. If given the chance to take the bus to their homes, they will [somehow manage to] work late into the night to make money for themselves whiles stressing the trotro’s engine. And don’t think it is beyond a trotro driver to give the bus to a colleague (spare driver) who probably has no valid license when they get tired during the day. It takes more than money to run this business; it takes a hard-nosed business man with lots of understanding of how trotro drivers think and ever ready to bark instructions or threaten termination to run this business successfully. But whiles the trotro driver tries to swindle his car-owner, the trotro mate also tries to pilfer from the fares that should go to the driver. There’s some justice in this trotro business after all. Did you ever sit in a trotro at the station that took forever to get full? How about sitting in a trotro with just one passenger left to get full? [begin picturing a hot day, dusty station and a mate who doesn’t stop shouting (as if that ever bring passengers any faster)]. Suddenly, two friends or a couple or siblings appear from nowhere to join the bus? “Aha! Finally, the bus can leave the station”, you’re thinking. But no, these 2 passengers either go together or join the next bus in line. “Sorry, we can’t overload today because the police have set up a check-point on the road” intones the mate [who is chatting with a ‘pure-water’ seller or orange seller at the station] stopping the 2 passengers from getting on board and answering your question even before it you give it voice. When passengers were needed in pairs and threes to fill up the bus none was coming and after bearing all the heat and pungent odours and the trickling in of passengers up to the point where only 1 passenger was needed to fill up the bus, two people turn up. At this point everyone would beg for the driver to consider overloading the bus. And a few mischievous minds are even thinking of suggesting to the driver to drop a passenger who isn’t going all-the-way to the last-stop in favour of these 2 passengers. Everyone heaves a sigh of relief but most passengers who could afford to pay for 2 feel somewhat embarrassed for not coming up the idea. After a couple of attempts to start the bus, the engine finally catches and glorious fresh air gets into the bus as it pulls away from the station. Passengers wipe beaded sweat [collected as a result of the heat in the parked bus and the nervous seconds when the bus wouldn’t start] off their foreheads and lean in their seats for a nice ride. Ten minutes into the ride, the bus stutters and looks of concern shows on everyone’s face. The jerky motion of the bus wakes the few passengers who’d managed to doze off after the bus hit the tarred road. The driver pulls over and the mate gets down and confers with the driver. Apparently the fuel is run out. The mate sticks his head through the doorway and presents the passengers with 3 options: A pick-your-poison moment! 3. You can wait for the mate to beg for a gallon to get diesel from the next filling station. What a bad trotro day! Whenever I go to the trotro station, or join one by the road side or even struggle to get one, my mind quickly goes back to some of my economics classes and I begin to understand the trotro driver better. This post seeks to make the point that trotros operate in a market economy as well as a monopolistic economy and I will give scenarios to support that assertion and maybe we will all begin to understand how the trotro driver operates. Every passenger is important to the trotro driver or otherwise, depending on the scenario and trotro drivers operate in ways to maximize their fare by filling filling their bus on every trip in order to make a decent ‘sale’ at the end of the day. 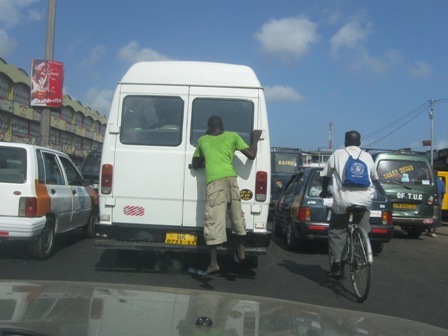 Competitive Market – Trotro driver A is competing against all other trotro drivers plying the Kaneshie to Mallam route. Ergo, he’ll doodle and stop at every point on the road to pick every and any passenger [load bearing kind or slow-to-walk-to-the-bus kind] till the bus is full. In this market, there are many passengers and many trotros that one passenger/trotro doesnot make a difference. Monopolistic Market – Trotro driver A is the only trotro plying Kaneshie to Mallam route. Before the bus leaves its destination, chances are it is full. If it is not full from origin, then you’re in luck to be by the roadside when it is passing. And you best be animated in flagging the driver or better be standing at a point he can reasonably/ safely stop to pick you up or the driver will just ignore you and pick the next passenger. In this market, there are many passengers and very few trotros that one trotro can make a HUGE difference. Oligopolistic Market – Trotro driver A is competing against all the other trotro drivers plying the Kaneshie to Mallam route but you’re one of the only few passengers at the station or by the road side. (Very unlikely market for trotro business) You wish! Having laid the basic foundation of markets [in an Economics sense], holding pricing constant (for trotros)…let us look at scenarios during different times of the day, different weather conditions, location and throw in taxis just to jazz the discussion up a bit. Rush Hour (at the trotro station) – Competitive Market – Trotro drivers are assured of a sturdy stream of passengers and passengers are reasonably assured that a trotro will come around to pick them up. Rush Hour (taxi) – Monopolistic Market – Sorry to say but taxis are a hot commodity any time of the day but especially so at rush hour, morning and evening. They quote a price, you pay up and get on board or they ride away as if they run on air and don’t even need your money. If you have an emergency, please dig into your emergency stash of money because you’ll have to pay through the nose. Midday (at the trotro station) – ‘Perfect'(pun intended) Competitive Market – Read this blog post! Midday (by the road side) – Oligopolistic Market – You’re a prized passenger, trotros will honk at the sight of you and you can afford to stroll to the bus, heck, you can decide not to join the rickety bus after taking a peek at the inside. It is payback time for all that trotro drivers ever did to you. Rainy day (by the road side) – Monopolistic Market – You didn’t anticipate the rain, neither did your friend warn you, even the radio didn’t mention it. You count yourself lucky if a passing trotro or taxi doesn’t splash mud on you, or you get a trotro mate who’ll pick a fare at the risk of getting a little wet. Be ready to pay through the nose (again?) to get a taxi to take you to your destination. Note: If you find yourself in a busy district then you’re automatically in a Competitive Market and the opposite is true!! So you see, in real life nothing is really one thing or the other….everything has in its nature to be a little big of this and that with varying degree depending on certain conditions.